"I was a eating a sandwich and my cap broke off… I was so embarrassed. I never thought it would be so simple to fix… My implant looks and feels so natural. I didn’t think that that I would look so much better than before." - C.G. Get your smile backThis patient came in with a fractured front tooth due to the breakdown of her previous endodontic treatment (apicoectomy). The gums surrounding the broken tooth were also grey. (It is usual for one’s gums to turn this color after root canal therapy. Color changes can also result from the metal margins of a crown). In an incisionless, minimally invasive manner, the fractured root was removed and the dental implant was placed immediately. 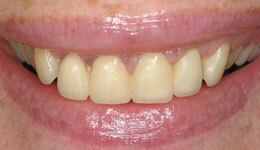 A white esthetic Zirconia abutment (post) and temporary crown were attached to it on the same day as well. The gums were adjusted to be the same height as the tooth next to it, restoring the patient's natural, symmetrical smile. "I was going to redo my crowns and my dentist recommended that I even out the gums to make my smile look more symmetrical. My smile is so much prettier!" -A.W. 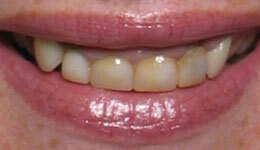 Perfect your smile!This patient's original smile showed an uneven gum-line. The two front teeth looked much longer compared to the adjacent teeth. 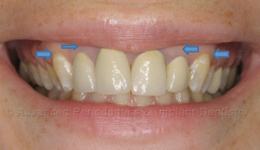 To reduce the amount of gum showing on those other teeth, crown lengthening was performed. 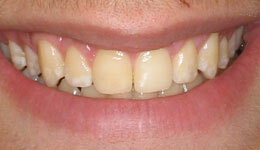 As a result, this patient has an even and symmetrical smile. 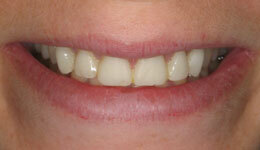 The crowns/veneers were also applied to her teeth, brightening her new smile. "I never liked my smile. When I found out I could have a simple procedure to improve it, I went for it. It was so simple and painless" - _._. No more gummy smile!This patient was suffering from gingival excess (enlarged gingival papillae), which gave off the appearance of shortened teeth. 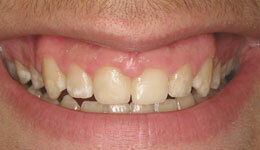 A gingivectomy was performed to remove excess gum tissue and to restore a proper, even height to the teeth. The patient left the office with a new, attractive non-"gummy" smile. "My teeth looked short, yellow, and thin and I had a lot of my gums showing. Now I can look pretty for the pictures." - C.W. Perfect your smileThis patient presented with short, worn-down teeth. After esthetic crown lengthening, she received the smile that she was looking for - less gingival display and the proper contour of teeth. "My gums and teeth were unattractive. But now they are fixed and I love smiling more." - A.R. 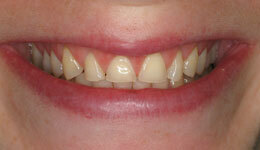 Perfect your smileThis patient presented with very short crowns, which caused a 'gummy' look to her smile. After laser esthetic crown lengthening and the placement of temporary crowns, she has a brand new smile!